The original Tour de Coop (TDC) wranglers have flown the coop. This just means that their lives have gotten so busy with new business ventures, family life and other projects that there isn't enough scratch to give a new coop and garden tour the time and focus needed to do a credible job. For the past couple of years we've asked around for a local gardening, urban agriculture and/or pet supply business interested in taking ownership of an existing community event. Any suggestions are welcome. Previous organizers would be happy to volunteer our resources and experience to see another TDC happen; we just can't spare the time to coordinate the event. Email serious suggestions to erik@ boisechickens.com (remove the space). So, when is the next local Tour de Coop? We've had a few folks ask about a 2013 Tour de Coop. The answer is, we are skipping this year and plan to reschedule the TDC for spring of 2014. It's lots of work and the core group of organizers have too much on our plates this year to take on the many moving parts in coordinating the event. In the meantime, check out our ambitious neighbors to the south at Wasatch Gardens (formerly Wasatch Fish and Gardens). 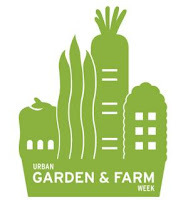 What used to be known as 'Chicken Week,' is being revised and expanded to Urban Garden and Farm Week / make-raise-grow and will take place in Salt Lake City June 16th to June 22nd. Some amazing events and activities are planned, so consider a road trip to see how they do things in the Beehave State. Another Tour de Coop Completed! 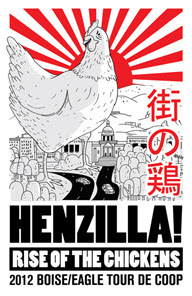 Henzilla Art by Boise's Own James Lloyd! A few preliminary photos are contained in this slideshow. Register Here! Register Now! It is Your Destiny! We'll email you the link to the online tour map Friday morning. You can prepay and reserve a shirt online, or (if you prefer to see the goods first) buy shirts this week at bricolage or NEON. Adult sizes $20; Youth sizes $15. We'll also have a selection of the past three Tour de Coop shirts at NEON during the after party from 4-7pm. Follow us on Twitter @cooptour for live updates throughout the tour! If you don't register, the terrorists win! The 2012 registration site is now up, thanks to Elizabeth Donick Swisher. Links to the online tour maps will be emailed to all those who register online: we'll send the link to you the week of the event. Folks can also purchase numbered hard copies at the above locations after September 20th or the day of the event. 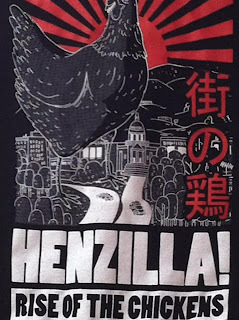 We will also have Henzilla shirts available during the after party (thanks to Shasta and Scully at www.deadwood-designs.com) and are hoping to add some very nice Henzilla-brand serged muslin tea towels as well from Juliana at InkPony. Wonderful gifts for those special tea-drinking friends. We will also have a few leftover shirts from 2010 and 2011 at the after party at NEON. We love the Henzilla artwork for this year's Tour de Coop. Hats off to Boise's own James Lloyd http://jameslloydprojects.tumblr.com. Coops this year will be clustered in NW Boise and Eagle. Biking is encouraged to reduce parking issues near the coops and at the after party; if driving, park strategically to reduce impacts on neighbors and other participants. Above all, be safe! Keep an ear out for Charlie Coe Music and his new piece entitled Main Street U. S. of A. Site of the future legendary 2012 after party. One of this year's beautiful North End coops. We are pleased to partner with the most excellent North End Organic Nursery (NEON) for this year's Tour de Coop after party. Register Here! Register Now! It's Fun! Expect to see several creative and interesting coops during the one-day tour, followed by food trucks and local beverage purveyors at NEON to help us all celebrate another year of visiting with local chickeneers, beekeepers and wannabee keepers. The plan at this point is to visit coops and gardens from 10am to 4pm on Saturday, September 22. Folks can start in Eagle or Boise, but we will all wind up eating, drinking and comparing favorites at NEON beginning at 4pm and going until 8 or so. If you haven't been to a NEON event before, you're in for a treat. After-After Party. Our friends at the Land Trust of The Treasure Valley are holding their awesome Dinner in the Hollow Saturday Night as well. We like 'em so much we wanted to give them a shout out here. One of the challenges each year is to get maps out to everyone. Until we've confirmed all hosts, we can't make the maps. A link to this year's maps will be emailed to all registrants late Thursday or early Friday. We are lucky to have lots of great local businesses in Boise and Eagle that will sell maps and t-shirts. NEON and bricolage are two locations in Boise. Thanks for being patient; we'll post updates here and plan to use Twitter (@cooptour) as well to keep folks updated. 2012 Tour de Coop - It's on, baby! What is Tour de Coop? Tour de Coop lets folks interested in backyard chickeneering see it first hand, ask questions and learn about breeds, coop design, egg production and the care and feeding of poultry. It's the best way to find out if chicken wrangling is right for you. Proceeds from map and shirt sales support continued TDC events. We are a small group of ordinary folks who think chickens are cool. We're doing our best to make this crazy event work and hope you all have fun! www.sccidaho.org. Simple theme. Powered by Blogger.